one place! Noxontown Lake rules! At Noxontown Lake you always meet someone from Middletown. Don't leave Noxontown Lake without visiting Lums Pond State Park, and take the kids on several fun rides at nearby Brandywine Picnic Park. Noxontown Lake is a privately owned lake, and is bordered on both sides by St. Andrews school. This is the place that ''Dead Poets Society'' with Robin Williams was filmed. They allow fishing here by the public, but can revoke permission, or prohibit your access at any time. They do not allow any fishing either before dawn or after Dusk. They have a groundskeeper that opens and closes a locked, fenced in area around the lake. They will come to open it at 15 minutes or so, before light, and will lock it up once it is dark. If your vehicle is in there after this time, you are spending the night there! They have a 10 HP restrictions on motors, but that was to stop the army of bass boats that descended on the lake from various states in the late eighties and early nineties, when the word got out about the size of the fish in Noxontown. Now, in the last few years, they have been permitting people with bass boats to come there, but a NO-WAKE policy is in effect. If you cause a commotion or disturbance they can prohibit them again, so you must be respectful. The school has boats docked in the lake on their property for students to use, and there is an area that is restricted and marked by signs in the water. They also hold races there, and there are lanes marked with floats for this purpose, so be careful with your outboard when fishing or crossing these areas. They also prohibit alcoholic beverages, and there is a State Game Warden there at the ramp most times in the spring and summer. He will check your license, coolers, and boats. The ramp is good, but has a slight drop-off when you get a few feet in, so launch slowly. The parking lot itself holds about 8-10 vehicles, but you can park on the side of the road, and walk back down. There are signs on the fences clearly stating all the rules. Noxontown Lake is larger than most other Delaware Lakes and ponds, and you need to have a game plan when you arrive for the first time, as the time you can spend on the lake is limited. The massive decent of out-of-state anglers is over now, but it still receives it's fair share of pressure. Many days there will be 8-10 boats here. The area by the dam and the road to your right after you leave the ramp is not worth spending your time with. Small bass and panfish are caught here, but there are better locations. Noxontown is about 4 feet deep on average, but most of the shoreline up close, is in 1-2 feet of water. The water is always stained to muddy, so your selections of lures and colors should reflect that. There are just hundreds of trees, rocks, gravel, sand, and laydowns, so you need to know where to spend most of your time. There are various types of vegetation, including lots of lily pads, that rise above the surface. The extreme upper end, is shallow and muddy, and holds less large bass than other sections of the lake. The first place to start is the North shore, about 200 yards up from the school. This area is best probed with spinnerbait and buzzbaits first for active fish, but it is definitely a jig or tube area. Work all this cover, (and there will be a lot of it), with a 3/8 oz. Black/blue jig with a Zoom or Uncle Josh trailer. Work each limb on the laydowns, and move in to the bases, before moving on to the next. The trees extend out over the water from the shore in many areas, so you need to practice skipping, and pitching, as well as flipping, if you want to work this lake properly. Work these lures all the way to the next cove on your right, then move up the lake about 200 yards, and start over again. These areas all hold large bass in the 4-8 pound category, and could come anywhere along this shore. Bass in excess of 9 pounds were caught at Noxontown in the past, which is why it received so much pressure. Very large bass still reside here, but the numbers have declined over the years. In 1999, I caught and released a 10. 1 pound largemouth from Noxontown, that was just ounces off the state record. The primary forage is panfish, white perch, and shad, but there are a good number of Golden Shiner also. 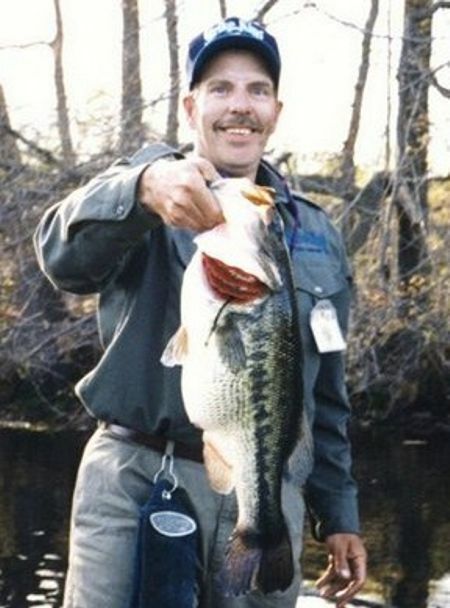 This lake also produced the state record White Crappie, over 4 1/2 pounds, which can be viewed at the Tackle Box store, on the main highway, just south of the 13 and 40 split, by the Dairy Queen. They have a variety of lures and bait, and can give current lake information also. The next area to work is the South shoreline by the cabins, and the adjacent cove. Large bass spawn in this area, and will also feed on baitfish and frogs, in the coves here, especially in the early mornings and near dusk. Many bass in excess of 4 pounds were taken here on 3/8 ounce buzzbaits worked in the brush and pads, and on 4 and 5'' Senkos and Tube baits in black and blue. The area by the launching ramp up to the first cove should be worked thoroughly with these same lures, and then you should back off and work the same area, a little further off shore, with a Rat-L-Trap in Chrome/Blue, and Crawfish patterns, and a Spinnerbait in shad or Bluegill colors, slow rolled on the drop-off. The areas by the floating docks in the middle portion of the lake is also a good choice for small straight tailed worms rigged with a 1/8 ounce bullet sinker, or a Senko, with no weight. Work them slowly around the floating docks and in the coves here. The Tournament frog has taken some large bass from the pads also, and shouldn't be overlooked later in the year. You should have a spinning rod in a 6 and 6 1/2 foot length, for the Senko and small grubs, worms, etc. It should be a high modulus graphite of good quality such as G. Loomis, and have a quality spinning reel geared at 5:1:1 or 5:3:1 . You will also need a 6-6 1/2 foot baitcaster, that you can get in close under the overhanging branches with, and a good Crankin rod in 7 foot length with a medium and a med/hvy action. A good quality reels geared in 5:3:1 and a higher speed for the buzzbaits such as a 6:1:1 or a 6:3:1. I use Stren line in 8-10 pound test on the spinning reels, and 17-20 pound test on the baitcasters. Remember, get out on the water early, as soon as it reaches 48-50 degrees. I have caught large bass here early and late in the year. Sometimes with air temperatures in the low 30's. Your chance at the fish of a lifetime is possible if you follow these simple rules.